The design of the DCW Les Acrobates de Gras No 325 is based on the Lampe Gras conceived by the French industrial designer Bernard-Albin Gras. 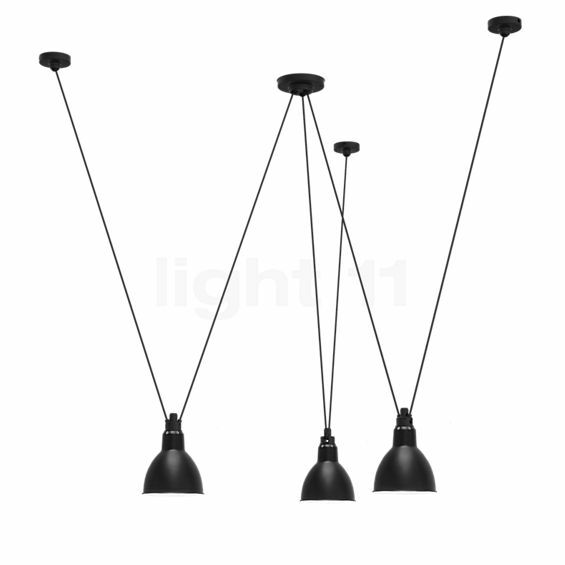 Its most prominent feature is the suspension, as the three reflectors are connected to six cables with a length of three meters each. Thereby, the hanging lamp seems like an acrobat dancing on a rope in the circus arena. In line with this theme, there is a great choice of reflectors available for the Les Acrobates de Gras No 325 which come in various shapes and colours. By using the configurator, you can customise the pendant lamp by DCW to match your interior design. The light is a piece by Bernard-Albin Gras created for the manufacturer DCW. The lighting effect of the DCW Les Acrobates de Gras is determined by the selected shade. Equipped with a reflector made of metal, the pendant light supplies downwards-directed zone light. Instead, the opal glass diffuser creates soft and evenly spread ambient light. In order to offer you even more creative freedom, the Les Acrobates de Gras comes with three meter long cables that can be shortened easily and arranged as desired. This allows you to create exciting arrangements that immediately attract attention. For the best lighting effect, the DCW Les Acrobates de Gras should be equipped with three LED retrofit lamps. Tell other customers and us about your experiences with the Les Acrobates de Gras No 325 ! Equipped with metal reflectors, the DCW Les Acrobates de Gras No 325 is ideally suited to be suspended above a dining table or a kitchen counter. There, the pendant light spoils the surfaces with harmonious zone light that creates a pleasant atmosphere for a relaxing family dinner. If you choose to equip your pendant light by DCW with glass diffusers instead, you get a fantastic base lighting that is particularly suitable for hallways and entrance areas.